The Wildcats lost their NEPSAC Class C semifinal game on penalty kicks. The teams finished the first half tied 0-0. KUA goalie, Olivia Brooker stopped a breakaway to keep the game tied. 15 minutes into the second half, Brewster struck first off a long shot under the crossbar. The lead did not last. KUA’s Casey Allen beat her defender and placed one to the far corner to equalize the game five minutes later. Sophie Braver, playing goal in the second half, deflected one over the crossbar and held on to 6 other shots to send the game into overtime. KUA’s Maike Lasser nearly scored the game winner when she caught the Brewster goalie far off her line but sent the ball just wide. Brewster hit the crossbar on the other end, but neither time could earn the overtime win. In PKs, KUA missed their first three shots and Brewster scored two for the win. KUA (13-3-3) finishes the season in 3rd place in the competitive Lakes Region League and as semifinalist in the New England Class C Tournament. 5 seniors will graduate, including captains Molly Davis, Scout Beaupre, and Esa Anderson, two-year letter winner, Lina Tommola and one-year senior Anna Rogers. Under frigid skies, the Wildcats managed to stay sharp and outscore a talented Berwick side for a 2-1 quarterfinal win. Gracie Gamache put Casey Allen through for a breakaway and the Wildcat’s first goal. Gamache finished a Kyra Russman-Araya long ball for the second goal and a KUA 2-0 lead at the half. Olivia Brooker, along with the back four of Bella Parento, Scout Beaupre, Molly Davis, Lina Tommola, and Anna Rogers, finished the half with a clean sheet and solid coverage of the defensive end. In the second half, both teams had their chances at either end. With 14 minutes remaining, Berwick was awarded a penalty kick and glimpse of hope, but KUA’s Sophie Braver held her ground and made the save. Center midfielders Esa Anderson, Maike Lasser, and Kat Maniatis were dominant in the middle. Berwick finally managed to score in the final seconds of the game. KUA (13-3-2) heads to Brewster Academy on Saturday at 1pm to avenge two of its regular season losses. The Wildcats finished their regular season with a 7-0 win over Vermont Academy. Maike Lasser and Casey Allen scored two goals a piece. Lucie Turcott, Emily Pariseau scored and Scout Beaupre also scored for the Wildcats. Lina Tommola, Kyra Russman-Araya, and Bella Parento assisted on goals. Olivia Brooker and Sophie Bridge teamed up to earn the shutout. KUA (12-3-2) is seeded #4 in the New England Class C tournament and will host Berwick Academy on Wednesday at 4pm in the quarterfinal match up. List of 19 news stories. In a hard fought battle, the KUA girls soccer team won 1-0 against Holderness. In the first half, Emily Pariseau set up Kyra Russman-Araya for the game winner, a bar down drive from the 18. Both teams had their fair share of chances, especially in the final 15 minutes. KUA’s Sophie Bridge stopped a breakaway and, at the other end, Sasha Lawton and Gracie Gamache just missed their chances inside the 6 yard box. Holderness pushed up two outside attackers the entire game, keeping the backline busy and on their heels. Hannah Asbury, Molly Davis, Scout Beaupre, and Lina Tommola spent a good deal of the day chasing down the speedy Holderness forwards. it was a well earned shutout and a good overall team victory. KUA (10-3-2) has the weekend off before playing Cushing Academy at home next Wednesday. The KUA girls varsity Played for Janie under the lights on Pope Field. At the 19 minute mark, the game paused and the KUA captains presented flowers and game balls signed by the team to Janie Cozzi's '19 mother, Erin, and brothers, Ollie and Ryder. KUA struck soon after when Emily Pariseau snuck in a pass from Gracie Gamache off a Scout Beaupre long throw. New Hampton tied the score moments later, but KUA did not hesitate to score and go into the half with a 2-1 lead. Maike Lasser slipped a ball to Willa McGough who finished with curving ball to the upper right. In the second half, Gracie Gamache fed Kat Maniatis down the left side who finished into the upper left. Sophie Bridge and Olivia Brooker split time in the net. KUA (9-3-2) plays Holderness on Wednesday. On the road less than 24 hours after their Friday night game, KUA found themselves in a battle against a fast and physical Wilbraham side. Despite good amounts of ball possession in the opposing end, KUA could not capitalize in the first half. Early in the second half, Wilbraham struck first off a long throw to take a 1-0 lead. With 15 minutes still remaining, Willa McGough found Kyra Russman-Araya at the top of the 18 who then finished with a low strike to the left post. Casey Allen, Molly Davis, Bella Parento, and Scout Beaupre were key figures in the back. Kat Maniatis, Esa Anderson, and Lucie Turcotte played non-stop, two way soccer throughout the game. Olivia Brooker and Sophie Bridge split time in the net for the Wildcats. KUA (7-3-2) plays New Hampton twice this week. 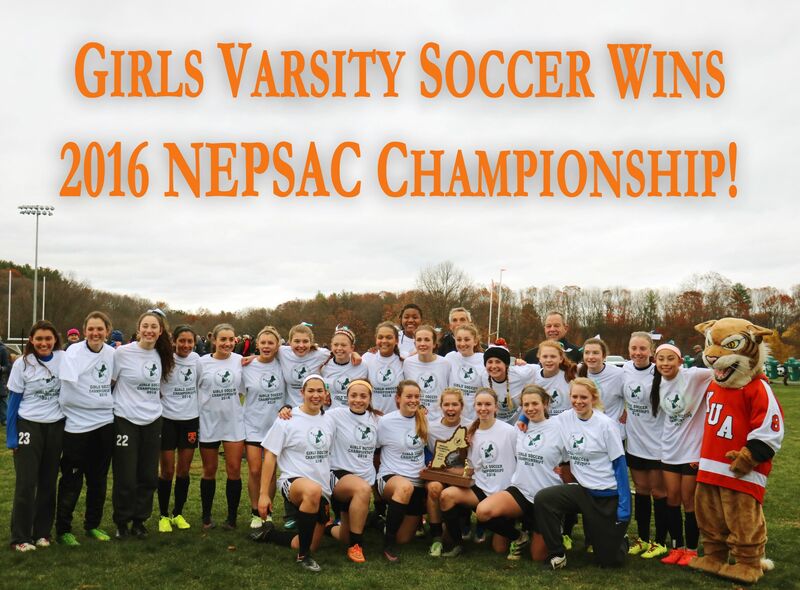 The KUA girls soccer team won 3-0 on the road against New Hampton. Casey Allen scored two of the Wildcat goals. Esa Anderson scored the third and added an assist. Emily Pariseau and Maike Lasser also contributed assists. Olivia Brooker and Sophie Bridge combined to earn the shutout. New Hampton's offense pushed up aggressively against the KUA back line but the combined defensive play of Scout Beaupre, Hannah Asbury, Anna Rogers, Bella Parento, and Molly Davis held them at bay and tilted the field in favor of the Wildcats. KUA (8-3-2) plays New Hampton again on Saturday, this time at home. Despite a 16-2 advantage in shots, the Wildcats barely squeaked out a 1-0 win over Proctor. KUA dominated possession but the Hornets were organized and tenacious around their 18. After two earlier attempts deflected off the post, KUA's Scout Beaupre played a perfectly placed chip to Gracie Gamache who finished on a full sprint. The back four held strong as Proctor managed a few well timed counter attacks. Olivia Brooker earned the shutout. In a game of highs and lows for both sides, the Wildcats and Big Red ended in a 1-1 tie. Despite the cold temps and high winds, both teams kept the ball on the ground and played skilled, possession soccer. Exeter nearly struck early with a low drive off the far post. KUA had two good chances of their own in the first half, but had to settle for a 0-0 tie at the half. Twenty minutes into the second half, Exeter nearly struck again, but KUA keeper, Olivia Brooke dove to her left and held on to keep the game scoreless. Moments later, Gracie Gamache found Maike Lasser at 20 yards for a patented laser just out of reach of the Exteter keeper's hands. KUA 1- Exeter 0. KUA nearly found the back of the net on two more opportunities, but could not come up with the insurance goal. With 5 minutes remaining, Exeter snuck through on a counter and found the back of the net from a the top of the box. KUA 1- Exeter 1. Though a heartbbreaking finish, the Wildcats walked off the field with their heads high and proud, once again, of their determined, disciplined effort. KUA (6-3-1) plays Friday night against Proctor under the lights on Pope Field. As the sun set and the temperature dropped, the Wildcats stayed hot, scoring 4 second half goals on their way to a 6-1 road victory. The KUA back four set the table for the attacking six. Aggressive defensive play against a talented Vermont forward gave the offense time and space to control the ball and push deep into the Vermont side. Molly Davis, Scout Beaupre, Anna Rogers, Bella Parento, and Casey Allen played their best games of the year, giving up very little space, time, and hope to a determined Vermont team. Gracie Gamache got the visiting team on to the scoreboard with a terrific solo effort down the right side. Kyra Russman-Araya settled and finished two precision passes, the first from Scout Beaupre and the second from Maike Lasser. Russman-Araya then assisted on two other goals, a corner to Bella Parento and then a through ball to Kat Maniatis. Esa Anderson controlled the midfield all game for the Wildcats. Zahra Baldauf put Molly French through one on one late in the game only to be called off-sides just as she was about to shoot. KUA (6-3) plays Exeter at home on Wednesday. Playing in unseasonally warm temperatures (not complaining), the Wildcats struggled to finish their opportunities, only to see the home team convert on their chances. In a game that featured two skilled teams and a battle for ball possession, both teams showcased their talent and skill. KUA held the advantage in corner kicks and direct kicks inside the Brewster half, but Brewster's speedy forwards were able to get behind the KUA backline with well-timed and placed passes. Early in the second half, Gracie Gamache drew multiple players as she swept across the top of the 18. She found Esa Anderson who collected and played the ball to Willa McGough for a bending ball strike into the lower left. KUA, lifted by the goal and down by two, did all they could to find the second answer and pull the game with one. Alas, Brewster finished another through ball and time ran out on the Wildcat's attempts to equal the series for the year. KUA (5-3) play Vermont Academy on Friday. Under sunny skies and in front of an energized home crowd, the Wildcats scored early and then finished strong to defeat the visiting Bulls 4-1. KUA’s Maike Lasser led the Wildcats with 3 goals. Lasser's first goal came off a Scout Beaupre patented long throw-in to the box. The ball took a KUA bounce, landed on Lasser's foot at the top of the 18 before she finished into the lower right. At the half, KUA led 1-0. Earlly in the second half, Beaupre combined with Gracie Gamache at the midfield line, took the ball deep into the Holderness end before slotting a ball to the 12 where Lasser waited to finish her second goal of the match. At the 60th minute, Kyra Russman-Araya found Lasser alone again, this time 26 yards yards from the goal where she drilled a rocket just below the crossbar to put the Wildcats up by three. Holderness earned one back on a long through ball and well placed finish. Casey Allen scored the Wildcat’s final goal, an unassisted laser from inside the box. Olivia Brooker finiished with three saves. KUA (5-2) travels to Brewster Academy next Wednesday. Despite skilled possession play throughout the game and a number of dnagerous balls served into the visitors 18, the home team Wildcats were unable to find the back of the net and came out on the losing end of a 2-0 hard fought battle. KUA's back four held strong all day against a speedy St Paul's attack. Keeper Olivia Brooker handled a number of crosses and one dangerous rebound before an unmarked St Paul forward found herself alone inside the 12 with time to slot the ball home. The game was played mostly between the 18s with both teams exchanging possession and through ball attempts. The field seeemed to be tilting in KUA's favor as the clock in the second ticked down. With its midfield and attacking wingers caught up field, a sudden counter attack by St Paul's with 6 minutes remaining resulted in a goal and 2-0 lead. The KUA girls fought hard the final few minutes to cut the lead back to one, but still the visiting team held strong. KUA (4-2) returns to action Friday at home against Holderness. The Wildcats traveled to Proctor Academy for a mid-afternoon showdown with the Hornets. The two teams matched up well in the first half with skilled possession soccer in the midfield and few through balls behind the aggressive backs on both sides of the turf. In the second half, Gracie Gamache outraced the Proctor backline to a throughball from Kyra Russman-Araya and was tripped as she was shootting. A red carrd was shown to the Proctor defender and a PK awarded to the Wildcats. Russman-Araya finished the PK and KUA went up 1-0. Moments later, Scout Beaupre drove a 40 yard direct kick just above the 6 yard mark and Maike Lasser finished a one time side volley into the near side upper ninety. As the Wildcats gained momentum, Gracie Gamache took the ball from the midline deep into the eighteen and drove a low cross across the six. A Proctor defender inadvertenly knocked the ball into her own net and KUA led 3-0. Keeper Olivia Brooker handled a few dangerous Hornet crosses and the backline of Molly Davis, Anna Rogers, Lina Tommola, and Casey Allen did their part to limit outside shots and any throughballs. KUA (4-1) plays St Pauls on Wednesday on Pope Field. KUA traveled to Tilton for a Lakes Region match up against the Rams. Under partly cloudy, humid skies, the Wildcats used their depth to wear down a determined Titlon side. KUA's Willa McGough scored 2 and assisted on another to lead the Wildcats to victory. Gracie Gamache scored one and also assisted on another. Bella Parento and Maike also found the back of the net. Kat Maniatis led all shooters with 5 shots on goal. Olivia Brooker and Sophie Braver split time in goal. KUA (3-1) travels to Proctor Academy on Saturday. The Wilcats played their first game on the newly refurbished Pope Turf Field. Dexter played a skilled, possession game, but the home game pressed aggressively, took advantage of its opportunities and built a 3-0 lead going into the half. Senior captain Esa Anderson led the offense with two first half strikes, one unassisted and one off a soft through pass from junior Bella Parento. Junior Kyra Russman-Araya one timed a lose ball for the third goal. Dexter narrowed the lead in the second half off a crossbar rebound, but KUA's Gracie Gamache beat her defender on the wing and set up Kat Maniatis for the fourth and final goal of the afternoon. Defenders Hannah Asbury, Molly Davis, ScoutB Beaupre, and Anna Rogers limited shots while goalies Olivia Brooker and Sophie Braver split time and saves (3 each). KUA (2-1) travels to Tilton on Wednesday. The Wildcats went up by two early in the second half and then held on for a 2-1 win over Northfield Mt-Hermon. KUA’s Bella Parento scored both of the Wildcat goals. Parento's first goal came off a Scout Beaupre long throw. Emily Pariseau flicked one the ball and Parento finished before the NMH keeper could react. On the second goal, Willa McGough ripped a one time shot off a Kyra Russman-Araya direct kick. The rebound fell to Parento where she powered home the game winner. NMH nealry pulled to within one soon after the second goal, but Gracie Gamache cleared a header of the Wildcat goal line and then goalie Olivia Brooker deined the rebound. Brooker finished the game with 8 saves. Maike Lasser nearly added a much needed insurance goal but the NMH keeper's outstretched hand barely deflected the ball wide. Esa Anderso, Molly Davis, and Lina Tommola won key battles in the midfield and backfield and Lucie Turcotte and Kat Maniatis added depth on the wings. The Wildcats opened their 2018 season against league rival Brewster Academy. Under warm, sunny skies, KUA was able to get an early bid on the goal line off a long throw from captain Scout Beaupre, only to be denied by a sliding Brewster defender. Both teams moved the ball successfullly in to the other's final third. Brewster, in quick succession capitalized on three long range upper net strikes. The game settled into a back and forth battle as the Wildcats found themselves down by three at the half. The field tilted towards the Brewster end most of the second half. Maike Lasser hit the post on a low shot just inside the 18. Moments later, a PK was called and Kyra Russman-Araya buried the penalty in the bottom right. A flurry of opportunities ensued, with forwards Gracies Gamache, Emily Pariseau, and Willa McGough each getting good looks at the Brewster net. The KUA backline held strong the final half of the game with defenders Molly Davis, Casey Allen, Kat Maniatis, Hannah Asbury, Anna Rogers, and Lina Tommola each turning back Brewster counterattacks and pressing forward to keep the opposing team pinned in. Olivia Brooker recorded 4 saves on the day. Esa Anderson held the middle of the park all game while outside midfielders Lucie Turcotte and Audrey Donahue made dangerous runs down their respective sides. Credit to Brewster for playing 80 minutes of tough, disciplined soccer. KUA plays NMH at home on Wednesday.